Dennis of white-trash-cooking.com in California makes salmon jerky. He learned the process from his Alaskan uncle. Martin Crawford of the Agroforestry Research Trust talks about the Forest Garden he planted at Schumacher College, Dartington, South Devon, United Kingdom over 14 years ago. Forest gardening is an interesting (and new to me) concept – that in temperate climates uses a young forest as a model. Martin explains that in conventional farming/gardening we use a lot of energy just to keep the land from going to back to the wild state it wants to get back to. Using the forest model, he says that very little energy goes into that kind of policing and so forest gardening ends up being much more low-maintenance than other forms of farming. Forest gardens allow you to grow a mix of food and medicinal plants (for example, nut trees, fruit trees, herbs, vegetables, etc.). He says you may grow up to 200 species of plants in any one forest garden. Here is a closer look at a food forest garden planted by Robert Hart in the UK. 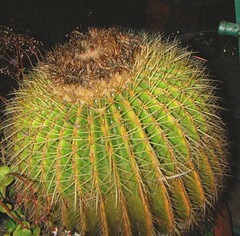 Take the barrel cactus and cut off around until you get to the white meat. Do not use center of cactus because it’s very hard to slice. Start by slicing one inch strips of cactus. Soak in cold water overnight. Next morning drain and slice into one inch cubic squares. Cook in boiling water until tender. Stir and dissolve syrup over low heat until thoroughly dissolved. Put in cactus and cool slowly until syrup is absorbed. Roll in powdered sugar. Even more uses of pine trees from thejourneyoutdoors in Michigan. He emphasizes being sure of your identification of the trees before you even think about eating from them. Labrador tea is an important wild, native North American group of medicinal plants. I say group because there are actually three closely related types of rhododendron that are identified as Labrador tea. They are evergreens that grown mainly in wetland areas. People drink Labrador tea as an all-around tonic (maybe like how some people drink nettle tea), and it’s loved for its flavor both as a tea and as a flavoring for meat. Note that it can have a narcotic and even toxic effect if it’s taken in large quantities. Here’s a joeandzachsurvival video explaining where to find Labrador tea , how to identify it and its uses. Joeandzachsurvival film in Minnesota. Elder Bertha Skye, who is Cree from Saskatchewan, is associated with McMaster University in Hamilton, Ontario, Canada, talks about Labrador tea’s important to indigenous people in Canada.